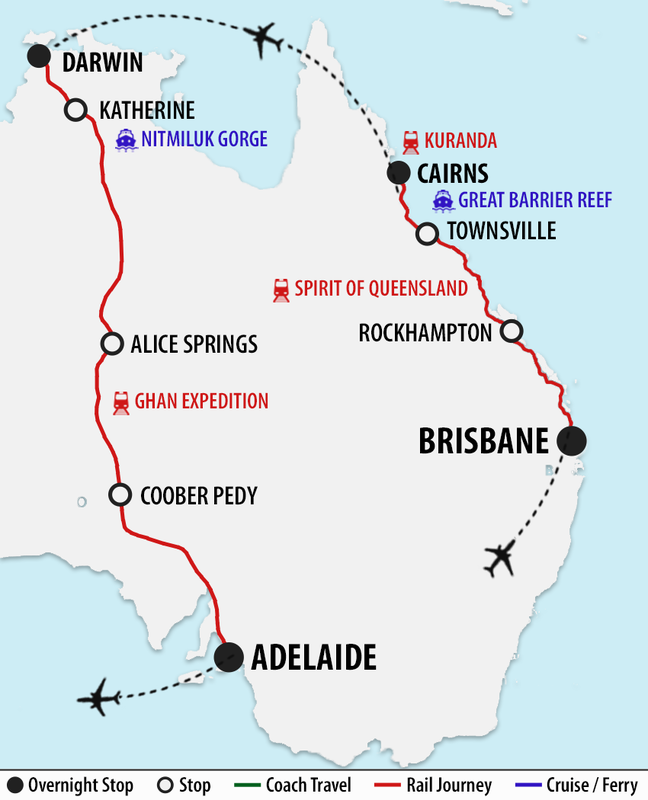 Discover 3 of Australia’s most iconic rail journeys – the Spirit of Queensland, the Kuranda Scenic Railway and the Ghan Expedition – on our most inclusive rail holiday ever! Your adventure begins this morning with a flight from your homeport to Brisbane. On arrival, you will be met and transferred to your hotel for your overnight stay. This morning, enjoy time to browse around the popular Brisbane Mall before transferring to Brisbane Railway Station to board the Spirit of Queensland train. Take advantage of the benefits of the revolutionary RailBed service, including a comfortable seat by day, personal entertainment and a flat bed at night. All bed linen, sheets, pillows and towels are provided. A 24-hour licensed Club Car provides refreshments, confectionary and beverages. Showers and toilets are located at the end of every carriage. Enjoy the culinary delights prepared using the freshest of Queensland produce – all meals are included and served to your seat. Wake up this morning as the train passes through the sugar cane fields of North Queensland. Sit back and relax as you watch the changing landscapes pass by. On arrival in Cairns this afternoon, you will be transferred to your accommodation. Tonight, enjoy a fabulous dinner in the hotel’s spectacular Bushfire Restaurant, with views over the esplanade. Board a cruise to Green Island this morning. A choice of activities are available today, including a cruise in the special glass bottom boat which allows passengers to see the brilliantly coloured fish and coral without getting wet! You are also able to join a semi submarine cruise allowing you an up-close experience to the marine life and Barrier Reef Coral. This tour also includes a magnificent buffet lunch served on the Big Cat cruise. Other activities on offer today include safe snorkelling or you can just laze on the island beach. 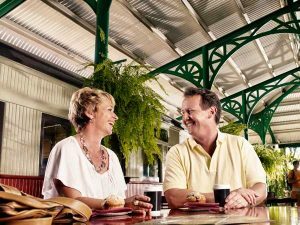 You will be met at your hotel after breakfast this morning and transferred to the Kuranda Train. This train trip gives you one of the world’s most breathtaking train rides, travelling through hand hewn tunnels and across bridges whilst enjoying spectacular views along the way. Stop at Barron Falls to watch the amazing waterfalls before arriving at the picturesque Kuranda Railway Station. Here, you will have time to explore the popular Heritage markets or visit the Butterfly Sanctuary or the Kuranda Koala Gardens. Later, board the Skyrail on a journey into the world’s most beautiful rainforest as you guide over the canopy. A coach will be waiting for you on arrival at Caravonica Lakes to transfer you back to your hotel. After breakfast, you will be treated to an escape into World Heritage Rainforest. The Daintree and Cape Tribulation National Park is one of the most significant in the world. We cruise into the Daintree and enjoy a BBQ lunch in a beautiful rainforest setting. Take a stroll along the boardwalk and beach at Cape Tribulation, ‘Where the Rainforest Meets the Reef’. Afternoon refreshments are provided before being returned back to your hotel. This morning, you will be transferred to Cairns Airport after breakfast for your flight to Darwin. On arrival in Darwin, you will be transferred to your hotel for some time at leisure. We have included some sightseeing choices to some of the best regions surrounding Darwin for you today. Choose from a selection of popular day tours below. Spectacular Kakadu National Park: Australia’s largest National Park, featuring a combination of mangrove fringed coastal areas, expansive flood plains, lowland hills, open woodland and forest habitats. View the wildlife from a cruise on the Yellow Water Billabong before visiting the Warradjan Aboriginal Cultural Centre and the Nourlangie rock art site. Litchfield National Park Waterfalls: Spend a day in one of the Northern Territory’s most scenic locations. Visit the town of Batchelor before entering the Litchfield National Park to take in the splendour of thundering falls, rainforest pockets and sacred heritage sites. See the incredible works of local termites and take a dip at Florence Falls. Later, marvel at the truly spectacular Tolmer Falls. Jumping Crocs & Nature: The Adelaide River is home to over 1600 Crocodiles and the famous Jumping Crocodiles. Cruise the river and watch these awesome creatures launch themselves out of the water. See these prehistoric creatures at close range before stopping at the Window on the Wetlands Visitor Centre for view over the Marrakai Plains and Fogg Dam Nature Reserve to view a wetland ecosystem up close. Darwin Helicopter Flight: Rise above Charles Darwin National Park to discover the natural, cultural, historical and modern delights from Darwin CBD to the northern beaches and East Point Reserve. View the two modern gas processing plants located within Darwin Harbour’s industrial area – one being the Icthy’s Project, the largest project the Japanese have commissioned outside of Japan. Motorsport enthusiasts, will also be spoilt with a view of Hidden Valley Motorsports Complex. Blue Water Fishing Adventure: The ultimate sportfishing in pristine bluewater destinations. Travel up to 50km from Darwin to some of the Top End’s best fishing locations such as Middle Reef, Fish Reef, Lorna Shoals & Charles Point and target reef fish including Golden Snapper, Rock Cod, Tricky Snapper, Jewfish, Coral Trout & Stripeys. Enjoy a full day at leisure in the Northern Territory’s largest city. Take in the city’s relaxed outdoor lifestyle – much of Darwin’s social activities take place outdoors at festivals, attractions and open air markets, in parks, reserves, by the beach or on Darwin Harbour. You may wish to join a tour of the city or board one of the city’s iconic harbour cruises (additional cost applies). A transfer will meet you at your hotel after breakfast this morning to take you to Darwin Railway Station. 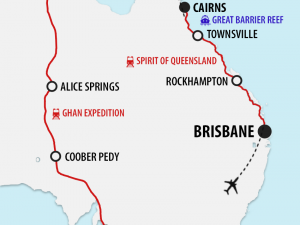 Here, you will board the Ghan train for your incredible, one-of-a-kind 4 day train journey experience. Your journey begins with a small but momentous step from platform to carriage where friendly staff will lead you through corridors to your private cabin. A delicious lunch is served aboard as you begin your journey south towards Katherine where you will join one of the included off-train activities. Back on board, you’ll return to the Queen Adelaide Restaurant to enjoy a delicious 3-course dinner as the sun sets over the Outback. Wake up to a new view outside your window, in a world which feels like a million miles from home. An outback sunrise could be one of the most spectacular you’ll ever see, setting the tone for the day ahead. After coffee, a juice and a sumptuous breakfast, arrive in Alice Springs ready to embark on one of the included Off Train Excursions. Come the evening you’ll dine beneath a canopy of stars at an authentic Outback Pioneer Dinner. This is a truly unique experience with live Australiana music and a feast of mouth-watering steak and traditionally made damper. After dessert, cast your eyes skyward and ponder life, the universe and everything with an informative astronomical talk. And with a full belly and deep sense of wonderment, it’s back on the train to rest up and roll out of Alice Springs, fulfilled in every sense of the word. There really is no better way to comprehend the vastness of the Northern Territory. Wake up and rub your eyes with disbelief as we pull into Manguri. Join one of the included off-train activities to Coober Pedy or the majestic Breakaways. Witness a dramatic change in landscape as the rich ochre tones of the outback make way for the beautiful green fields and pastoral lands of SA. The Ghan rolls into Adelaide. Interstate travellers will be taken to Adelaide Airport in time for their flight home. Within 130 days of departure – 100% of total booking value.